The Duke and Duchess of Cambridge have released a new image of their family Christmas card which features their three children. The royal couple have selected an autumnal picture for their annual festive greeting, which sees them seated on a log alongside their children, Prince George, five, Princess Charlotte, three, and Prince Louis, eight months, with the group all wearing coordinating blue in the grounds of their country retreat, Anmer Hall, in Norfolk. Kensington Palace wrote on Twitter: "The Duke and Duchess of Cambridge are pleased to share a new photograph of their family. "The photograph, taken by Matt Porteous, shows The Duke and Duchess with their three children at Anmer Hall, and features on Their Royal Highnesses' Christmas card this year." 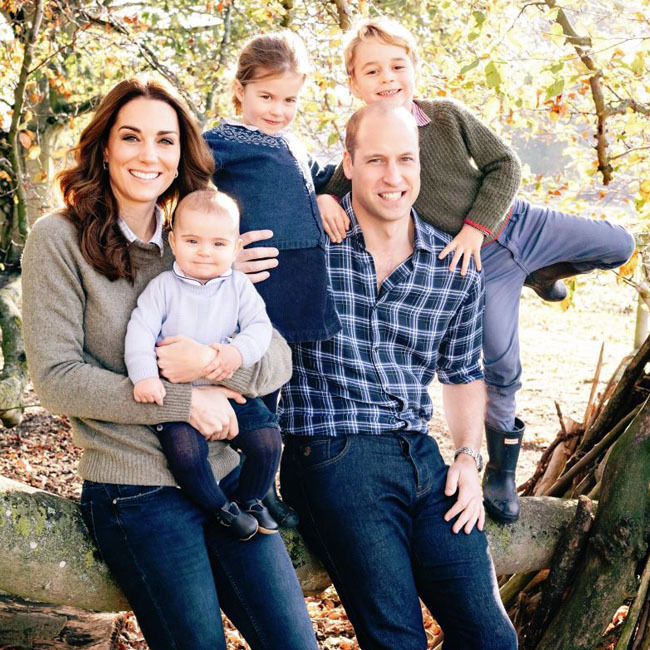 Duchess Catherine is pictured in denim jeans with her arms around Louis in the portrait, while George and Charlotte stand on a tree trunk alongside their father, Prince William. The Duke and Duchess of Sussex have also released a never-before-seen black and white image from their wedding reception at Frogmore house back in May. Duchess Meghan - who is expecting her first child in the spring of 2019 - is wearing her gorgeous Stella McCartney gown alongside Prince Harry, and the couple are seen with their arms wrapped around each other watching fireworks at their lavish wedding reception. Kensington Palace added on Twitter: "The Duke and Duchess of Sussex are delighted to share a new photograph from their Wedding Reception at Frogmore House on 19th May. "The photograph, which features on Their Royal Highnesses' Christmas card, was taken by photographer Chris Allerton."